Winning team at Bowl for the Cure are, back row, from left: Jim Patterson and Andrew Kennedy. Front row, Sierra Smith, Carol Patterson and Tracy Zeigler. Beth Overmoyer, breast cancer survivor, looks over the bowling balls before choosing the one with which she made the first toss during the Bowl for the Cure event. Ed Welsh, Morrow County Deputy Sheriff, receiving the Above and Beyond award for raising the most money for this event. He received the award from Deb Popp, owner and proprietor of Morrow Lanes. 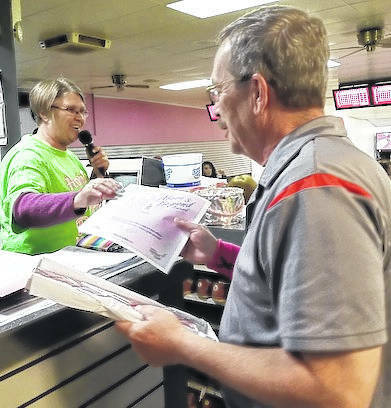 CARDINGTON — Organizers of the 11th annual Bowl for the Cure, held at the Morrow Lanes on Feb. 17, expressed gratitude for the success of the event, which benefits the Susan G. Komen Breast Cancer Foundation, Columbus Affiliate. A total of $3,283 was raised with nine teams participating. Winning team members were Carol Patterson, Jim Patterson, Tracy Zeigler, Sierra Smith and Andrew Kennedy. Patterson, of Marion, said she bowls in honor of her cousin, who died of breast cancer at age 32. The honor of tossing the first ball was given Beth Orthmeyer, a breast cancer survivor from Marion. Winning the highest fund raiser award was Morrow County Deputy Sheriff Ed Welsh, who raised $256. Door prizes were awarded including a $100 Kroger gift card won by Tracy Zeigler and Robyn Stiffler was the 50/50 winner of $100. She donated $50 back to the foundation. Harper Bowman, granddaughter of Larry and Deb Popp, owners and proprietors of Morrow Lanes, won the pink Bowl for the Cure Bowling Ball. This annual event is a memorial to Kendra Benson, a niece of Deb Popp who passed away in 2006 of breast cancer. Since the inception of this event in 2007, a total of $33,374 has been raised, Organizers were El Donna McKinniss, Carol Patterson and Dawn Fleming. Deb and Larry Popp, owners and proprietors of Morrow Lanes, have hosted this event all 11 years. 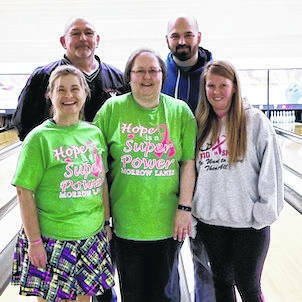 https://www.morrowcountysentinel.com/wp-content/uploads/sites/29/2018/02/web1_Winning-team-another-shot.jpgWinning team at Bowl for the Cure are, back row, from left: Jim Patterson and Andrew Kennedy. Front row, Sierra Smith, Carol Patterson and Tracy Zeigler. 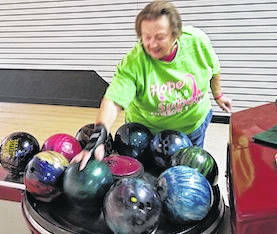 https://www.morrowcountysentinel.com/wp-content/uploads/sites/29/2018/02/web1_Beth-picking-ball.jpgBeth Overmoyer, breast cancer survivor, looks over the bowling balls before choosing the one with which she made the first toss during the Bowl for the Cure event. https://www.morrowcountysentinel.com/wp-content/uploads/sites/29/2018/02/web1_Ed-Welsh-receiving-the-above-and-beyond-award.jpgEd Welsh, Morrow County Deputy Sheriff, receiving the Above and Beyond award for raising the most money for this event. He received the award from Deb Popp, owner and proprietor of Morrow Lanes.